With an almost 6-meter-high and coffered ceiling (approximately 20 ft.), our Festsaal offers an elegant framework for your celebration. A historical staircase leads to this impressive room, where you can celebrate your fairytale wedding with up to 120 people in a castle atmosphere with big chandeliers. 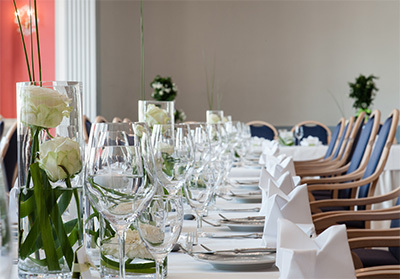 However, this room is also well-suited for birthday celebrations and other family events. The Festsaal spreads out over almost the entire second floor of the main building. 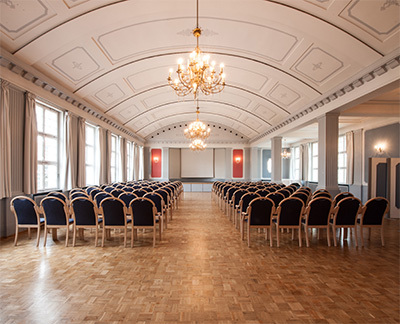 Next to the Festsaal is the Görlitzsaal, which is automatically reserved as an additional room for big celebrations.